CLEARFIELD – On Monday the Clearfield County Election Board voted to accept a supplementary report and proposed redistricting map, which sends Bradford Township’s election precinct issue back to court. According to a previously-published GANT News report, both Pennsylvania Election Code and an order from President Judge Fredric Ammerman required the board to review the township’s petition and to present a recommendation. Kesner said while the petition acknowledged this legal requirement, its attached map only showed a diagonal line from a northwest point to a southwest point on the Bradford Township line. He noted that neither the map nor the petition indicated how that diagonal line specifically complied with the statutory requirements, further explaining that it can’t be correlated with any specific roadways, streams, monuments, etc. On Oct. 23, the Election Board met and after which its report was sent to the court with the sole recommendation being for the court to schedule and conduct a hearing on the township’s redistricting petition. On Nov. 13, the board conducted a special meeting and revisited the matter, as Ammerman ruled it had a “mandatory duty” to recommend a redistricting option and it couldn’t merely leave the decision to the court. Commissioner John A. Sobel said the board had done further investigation and had the county’s GIS Department generate maps proposing redistricting options. However, it was decided to table any action until Kesner had time to thoroughly review the matter. Kesner prepared a supplementary report with an attached map generated by county GIS Director John Kaskan. He said the proposed map divides Bradford Township in accordance with census blocks established by the last federal census. It was also noted that the map follows the boundaries of the township’s two census blocks, which is depicted in the photograph below. Kesner said based upon his legal research, the court does have a “measure of discretion” in the matter, meaning it has the ability to decide what’s in the convenience of the voters and in the public’s interest. He said when the court conducts a hearing on the township’s petition, it would be open to the public. However, he said it would not be a “public meeting” and instead be under the direction of the judge who would set the rules of procedure. Before the board voted on its proposed mapping recommendation, Commissioner Mark B. McCracken indicated it met the “legal requirement,” but he felt “this isn’t the resolution” the petitioners were looking for. He said hopefully, there’s a public hearing and the court takes a “good, hard look at this.” Perhaps after that, he said there could be a proper precinct map ordered that would best satisfy the citizens of Bradford Township. Kesner responded, saying in all due respect, it would be difficult for the board to conclude what the petitioners want. From a legal standpoint, he said it wasn’t part of their petition in the forms of a detailed description and a division with clearly visible physical boundaries conforming with census blocks. “Attached was a map with an arbitrarily-drawn line that doesn’t comply with any physical boundaries,” Kesner said. “But they’ll have their opportunity to clarify that when the court conducts its hearing. 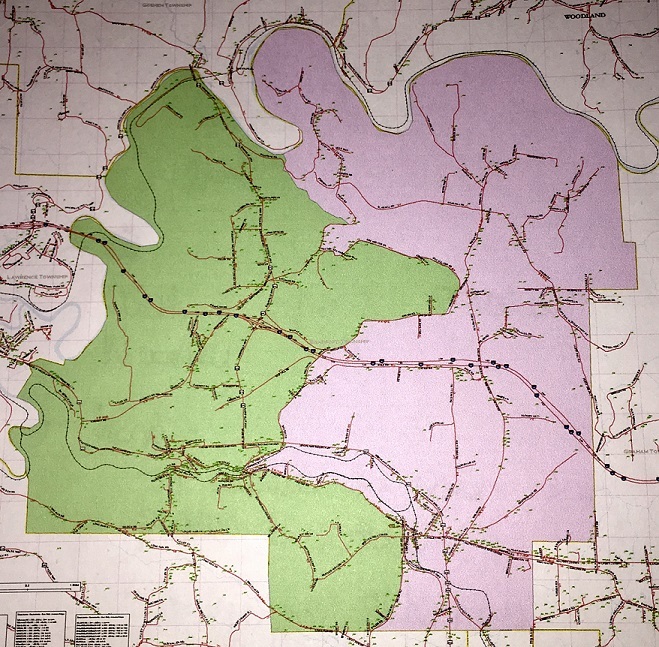 McCracken, despite his previously stated reservation, motioned for the board to accept the supplementary report with its proposed redistricting map and to submit it to the court. It was seconded by Commissioner Tony Scotto and subsequently approved. Kesner said he planned to file the report Monday with the county’s Prothonotary Office and also to deliver copies to the court and the township’s legal counsel, C.J. Zwick. Kesner said once filed, Election Code provides that the court shall not make any final order for redistricting until at least 10 days after notices have been posted in at least five public places in the election districts and in the immediate area of the affected polling places. “This is a statutory process,” he explained. He went on to say while the court has a discretionary measure with regards to the final outcome, it also maintains discretion with regards to the legal procedure. According to previously-published reports, on March 13, the Election Board decided to keep Bradford Township’s precinct boundaries, as defined by a court order issued in 1985, which upset township officials and residents. From 1998 through 2001, the county completed a 911 project. Its purpose was to assign locations/directions to every household in Clearfield County. Prior to this, residences, especially in the rural areas, were assigned route numbers. This made it virtually impossible for county officials to determine where voters were residing within an election district. The precinct issues arose after the last presidential election in 2016 when there were allegations of fraud across the country. State officials were mandated to ensure the validity of voter registrations. It was discovered then that some voters were possibly not voting in the correct precincts in Clearfield County, which resulted in a notice being mailed out. The commissioners previously directed the Election Office to halt mailing notices until a final decision was made. In March, the staff was directed to resume their mailings to the affected voters following a special Election Board meeting. Bradford Township has two election precincts, which are Bradford First and Bradford Second. In October of 2017, Bradford Second Precinct had 1,164 registered voters to just 569 in the Bradford Township First Precinct. As of Sept. 26, Bradford First had 994 registered voters and Bradford Second had 714.